So it has no mistletoe. from "Tales and Tarradiddles", by The Perfessor and Alter Ego, Esq. 1925. Angus and Robertson. actually written and illustrated by Launcelot Harrison (1880-1928), zoologist. The mistletoebird (Dicaeum hirundinaceum), also known as the mistletoe flowerpecker, is a species of flowerpecker native to most of Australia (though absent from Tasmania and the driest desert areas) and also to the eastern Maluku Islands of Indonesia in the Arafura Sea between Australia and New Guinea. The mistletoebird eats mainly the berries of the parasiticmistletoe and has adapted its digestive system to help spread the mistletoe seeds. The mistletoebird is one of 44 species of flowerpeckers (Family: Dicaeidae). Flowerpeckers are considered to be nearest in avian evolutionary relationship to the sunbirds (Family: Nectriniidae). Both the flowerpeckers and sunbirds are thought to be early offshoots of the early passeroid radiation that occurred 20-30 million years ago. The mistletoebird is a geologically recent arrival into Australia from South-East Asia. It is thought to have started colonising Australia from about two million years ago. Molecular-based scientific methods have been used recently to evaluate generic taxonomy within the flowerpeckers family. The flowerpicker genetic subdivision is based on a single morphological character- the length of the outermost primary wing feather. Most flowerpickers are sexually dichromatic, have stouter bills than sunbirds and display a broad variety of tongue structure. Genetic analysis of mitochondrial DNA of 70% of flowerpecker species showed the mistletoebird and red-capped flowerpecker (D. geelvinkianum) to be each other's closest relative. The mistletoebird derives its name from the name of the swallow (Hirundo) and refers to its long and pointed swallow-like wings. The mistletoebird is small, 9–10 cm long and 7.5–11 g weight. The male is glossy blue-black above, with a red chest and a slight red under-tail, and a black center stripe running down its white belly. The female is dark grey above, with a white throat, light grey underparts, and just a touch of pinkish-red under the tail. The eyes, bill and legs are black; the bill is just over a centimeter long, slender, slightly down-curved and sharply pointed. Immature birds are similar to the female, but have an orange-pink bill instead of black. There is a variance in size and colour across their distribution. The adult mistletoebird is smaller in the north of its distribution and females in the north have lighter coloured underparts compared to darker ones in the south. The mistletoebird has long pointed wings and a short square tail with a slight notch at the tip. They usually occur singularly or in twos but occasionally in small family groups or flocks and very occasionally in mixed-species flocks when food is in abundance. Their flight is swift and are usually seen flying above or high in the tree canopy on distinctively pointed wings., while posture is usually upright when perched but adopt a more horizontal, swaying posture when alarmed. The male mistletoe bird can be mistaken for a scarlet robin (Petroica multicolor) or flame robin (Petroica phoenicea) but has no spot on the forehead and has a black streak on the white belly. Right: Thornbill - at Ingleside. AJG Photo. Due to the combination of size, shape, behavior and plumage the Mistletoebird is unlikely to be mistaken for any other Australian passerine, however the Pardalote and Thornbill are the closest in size and shape. Mistletoebirds are nomadic and their movement is associated with the fruiting of the mistletoe tree. They are more likely to occur in mature stands where trees are larger and more likely to have become infested with mistletoe, rather than in regenerated areas. Specialist fruigivous birds, by eating mainly fruit, have a diet rich in carbohydrates and poor in protein. To increase the protein level, important for reproduction and molting, the mistletoe bird has to eat large quantities of the mistletoe fruit. Honeyeaters source much of their protein from arthropods and will venture far to obtain this and are considered a conduit for long distance mistletoe seed dispersal while the mistletoebirds generally concentrate on and limit their feeding to local mistletoe infestations. There are over 1300 species of mistletoe around the world and about one hundred in Australia. As the mistletoe obtains its water and nutrients from their host tree via a specialised vascular attachment, sometimes resulting in the demise of the host tree, but as mistletoe manufacture their own carbohydrates using photosynthesis they are referred to as 'half parasitic'. There was an ecological balance between the parasitic mistletoe and their host trees before this was disturbed with excessive forest clearing. Land clearing to accommodate farming practices and population growth created an imbalance that resulted in excessive infestations of mistletoe in some areas leading to forest degradation and total lack of mistletoe in other areas. Mistletoe density in Eucalyptus forests in Australia ranges from 0 to over 100 plants per hectare where this high value is from highly damaged habitat. From natural intact forests there are typically less than 10 plants per hectare. Avian richness increases with mistletoe density until a threshold of approximately 20 plants per hectare is reached after which heavy grazing and degradation sets in. 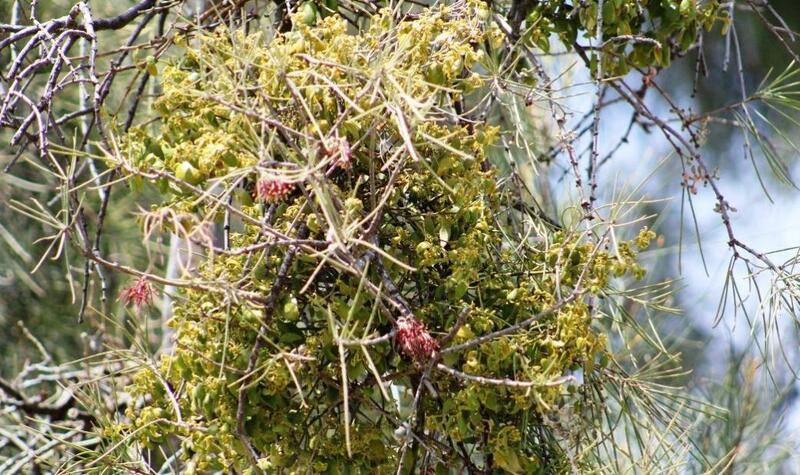 Areas of excessive infestation of the parasite mistletoe badly damages or kills the host trees. 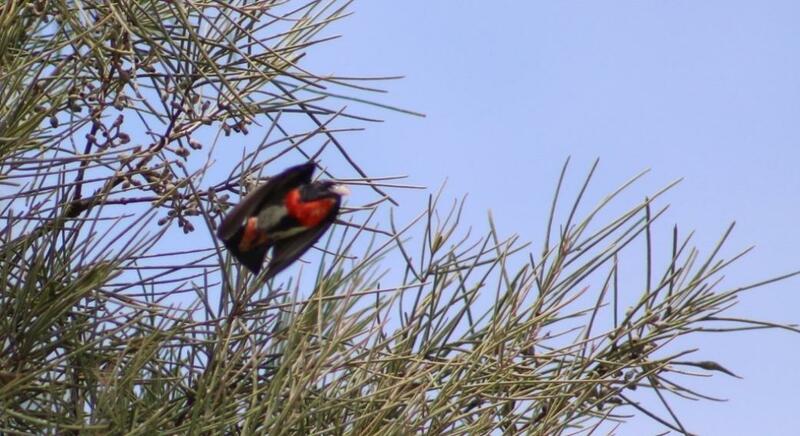 The reaction to this was to try and eradicate the bird seen as spreading the parasite, the mistletoebird. One farmer of the 1930s claimed to have destroyed over 1200 mistletoebirds in a 6-year period. A perusing of newspapers of this period brings up many articles claiming the mistletoe plant is responsible for the demise of trees and the bird was held responsible. Fortunately they are no longer actively persecuted. This little Australian bird (Dicaeum hirundinaceum) is well known to many persons as being chiefly responsible for the distribution of the very destructive mistletoe (Loranthus) pest, of which there are over fifty species recorded in Australia. This bird does not inhabit Tasmania, and during the writer's visits to that lovely island, he was surprised to find that mistletoe was also absent there. The writer has studied the bird for many years, and met with, it in every part of Australia, even at far inland places over 800 miles from the coast. It measures only a little over three inches long. The male is of a glossy bluish-black, with scarlet on the throat and under the tail, while the female is considerably paler throughout. The accompanying photograph shows one of its small and neat purse or pouch-shaped nests, a little less than natural size. This beautiful structure is soft and quite felt-like to the touch. It is usually suspended from a twig on a small tree or bush. Two or three white eggs are laid. The birds are very common, even about Sydney, and feed upon insects and fruit, extensively so upon the small and glutinous berries of the mistletoe. They are considered to be the chief factor in spreading the seeds of this pest which grows upon many different species of trees both native and introduced. It is often placed upon the bark by the bird when wiping its bill while endeavoring to remove the seed. The chief cause, however, is by the seeds passing through the bird in the ordinary way and becoming glued to the branch. I have often closely watched mistletoe birds feeding on these berries, both ripe and half green. It is surprising how quickly they can remove the skin and gulp down the fruit. The sticky seeds are constantly being passed out, and I observed that even during heavy rain they were not washed off the bark. The breeding season is from August to April depending where in Australia, but usually coincides with the fruiting of mistletoe. 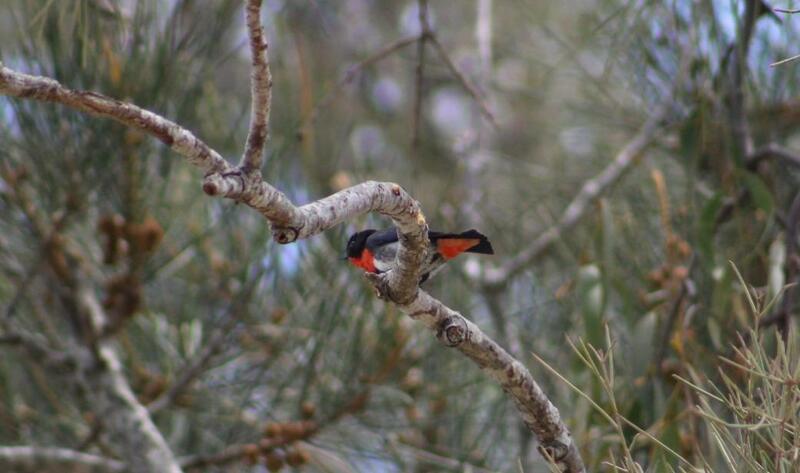 Mistletoebird pairs nest solitarily and raise up to 3 broods per season. A clutch of three or four white eggs, 17 mm x 11 mm oval in shape will be incubated for 10–12 days and the young remain in the nest for approximately 15 days. The fledglings are fed by both parents but mainly the female. The hatched birds are initially fed arthropods after which mistletoe berry pulp is then gradually introduced into their diet. After about two weeks, when they are ready to fledge, the mistletoe berry pulp comprises 80% of food intake of the young mistletoebird. The nest can be found in many different plants but especially in eucalyptus, mistletoe, and acacia trees where it is suspended from an outer twig or thin horizontal branch and concealed among foliage. Their nests are pear shaped with a slit side entrance and are usually made of plant down, wool, spider webs and spider egg sacs. The outside of the nest is coated with dry plant material like leaves, bark and lichen. The nest is built by the female, but accompanied by the male who assists very occasionally. Mistletoe bird by Neville Cayley (1854-1903) - created 189?, courtesy National Library of Australia - PIC Drawer 6431 #R6318-Mistletoe bird. They have a variety of vocalizations but their most familiar is a short sharp high pitched tzew or dzee whistled mainly on the wing. Songs while perched include a whistled wissweet wissweet, uttered repeatedly. Mistletoebirds can vocally mimic other birds. Heard in all seasons and sung by both sexes, they have been recorded mimicking the mulga parrot ( Psephotus varius) as well as more than 25 different species of passerines. Mistletoe is the common name for most obligate hemiparasitic plants in the order Santalales. Mistletoes attach to and penetrate the branches of a tree or shrub by a structure called the haustorium, through which they absorb water and nutrients from the host plant. The name mistletoe originally referred to the species Viscum album (European mistletoe, of the family Santalaceae in the order Santalales); it was the only species native to Great Britain and much of Europe. A separate species, Viscum cruciatum, occurs in Southwest Spain and Southern Portugal, as well as North Africa, Australia and Asia. Over the centuries, the term has been broadened to include many other species of parasitic plants with similar habits, found in other parts of the world, that are classified in different genera and even families — such as the Misodendraceae and the Loranthaceae. Parasitism has evolved at least twelve times among the vascular plants; and of those, the parasitic mistletoe habit has evolved independently five times, in the Misodendraceae, Loranthaceae, and Santalaceae, including the former separate families Eremolepidaceae and Viscaceae. The largest family of mistletoes, the Loranthaceae, has 73 genera and over 900 species. Subtropical and tropical climates have markedly more mistletoe species; Australia has 85, of which 71 are in Loranthaceae, and 14 in Santalaceae. Mistletoe was often considered a pest that killed trees and devalued natural habitats, but was recently recognised as an ecological keystone species, an organism that has a disproportionately pervasive influence over its community. A broad array of animals depend on mistletoe for food, consuming the leaves and young shoots, transferring pollen between plants and dispersing the sticky seeds. 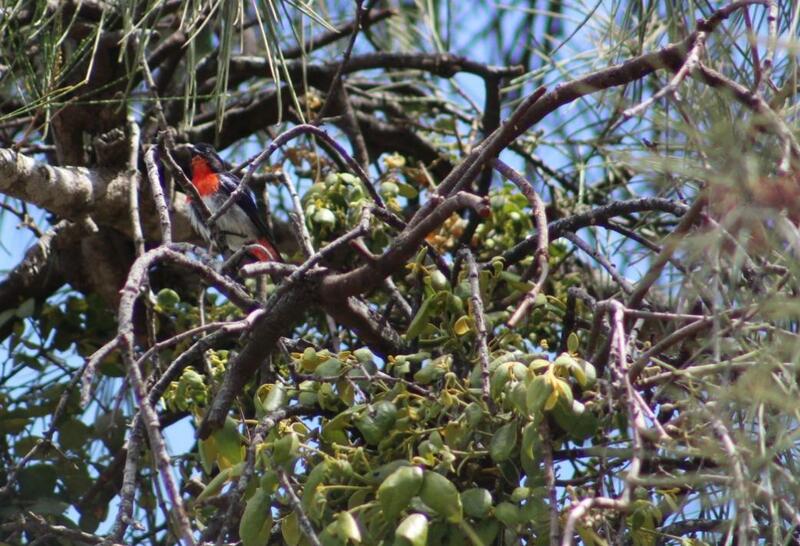 In Australia the diamond firetail and painted honeyeater are recorded as nesting in different mistletoes. More than 240 species of birds that nest in foliage in Australia have been recorded nesting in mistletoe, representing more than 75% of the resident birds in some areas. A study of mistletoe in junipers concluded that more juniper berries sprout in stands where mistletoe is present, as the mistletoe attracts berry-eating birds which also eat juniper berries. Such interactions lead to dramatic influences on diversity, as areas with greater mistletoe densities support higher diversities of animals. To some, rather than being a pest, mistletoe can have a positive effect on biodiversity, providing high quality food and habitat for a broad range of animals in forests and woodlands worldwide. Mistletoe is relevant to several cultures. It is associated with Christmas as a decoration, under which lovers are expected to kiss. Mistletoe played an important role in Druidic mythology in the Ritual of Oak and Mistletoe. In Norse Mythology, Loki tricked the blind god Hodur into murdering Balder with an arrow made of Mistletoe, being the only plant to which Balder was vulnerable. Some versions of the story have mistletoe becoming a symbol of peace and friendship to compensate for its part in the murder. Mistletoe continued to be associated with fertility and vitality through the Middle Ages, and by the 18th century it had also become incorporated into Christmas celebrations around the world. The custom of kissing under the mistletoe is referred to in late 18th century England: the serving class of Victorian England is credited with perpetuating the tradition. The tradition dictated that a man was allowed to kiss any woman standing underneath mistletoe, and that bad luck would befall any woman who refused the kiss. One variation on the tradition stated that with each kiss a berry was to be plucked from the mistletoe, and the kissing must stop after all the berries had been removed.